Please a take a look at the AllHeikin-Ashi which is based on the AllAverages_v3.1. 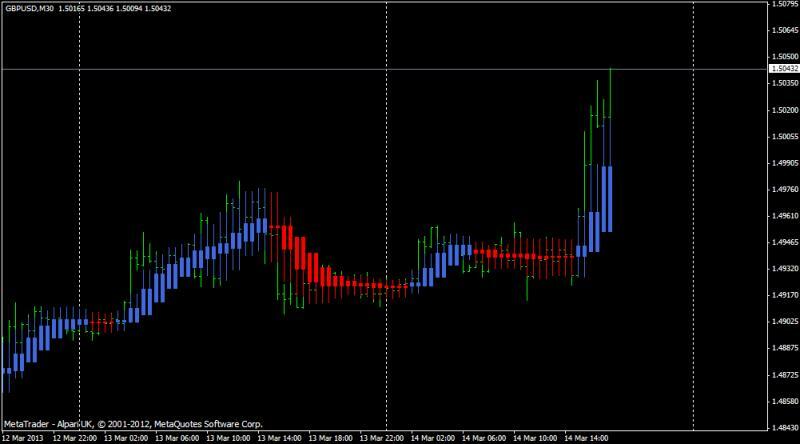 This is MTF version of the well-known indicator with static filter(MinMove) in pips. electrical999, Alex-162, levonisyas and 2 others like this. And some article from stockcharts website. Heikin-Ashi Candlesticks are an offshoot from Japanese candlesticks. Heikin-Ashi Candlesticks use the open-close data from the prior period and the open-high-low-close data from the current period to create a combo candlestick. The resulting candlestick filters out some noise in an effort to better capture the trend. In Japanese, Heikin means "average" and "ashi" means "pace" (EUDict.com). Taken together, Heikin-Ashi represents the average-pace of prices. Heikin-Ashi Candlesticks are not used like normal candlesticks. 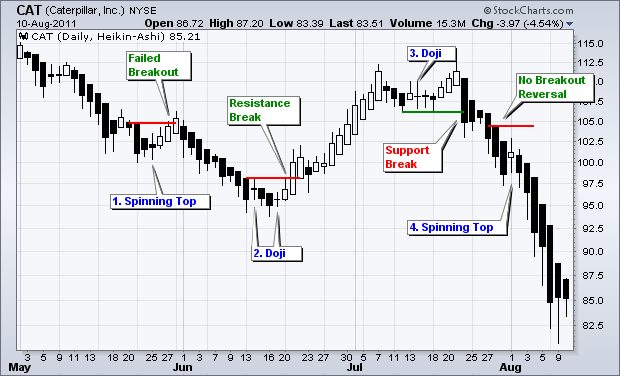 Dozens of bullish or bearish reversal patterns consisting of 1-3 candlesticks are not to be found. Instead, these candlesticks can be used to identify trending periods, potential reversal points and classic technical analysis patterns. Heikin-Ashi Candlesticks are based on price data from the current open-high-low-close, the current Heikin-Ashi values and the prior Heikin-Ashi values. Yes, it is a bit complicated. In the formula below, a "(0)" denotes the current period. A "(-1)" denotes the prior period. "HA" refers to Heikin-Ashi. Let's take each data point one at a time. the current Heikin-Ashi candlestick close. Before moving to a spreadsheet example, note that we have a chicken and egg dilemma. We need our first Heikin-Ashi candlestick before we can calculate future Heikin-Ashi candlesticks. Therefore, the first calculation simply uses data from the current open, high, low and close. The first Heikin-Ashi close equals the average of the open, high, low and close ((O+H+L+C)/4). The first Heikin-Ashi open equals the average of the open and close ((O+C)/2). The first Heikin-Ashi high equals the high and the first Heikin-Ashi low equals the low. Even though this first Heikin-Ashi candlestick is somewhat artificial, the affects will dissipate over time (usually 7-10 periods). StockCharts.com starts its Heikin-Ashi calculations before the first price date on each chart. Therefore, the affects of this first calculation will have already dissipated. The chart above shows examples of two normal candlesticks converting into one Heikin-Ashi Candlestick. Heikin-Ashi Candlesticks are similar, but different than normal candlesticks. A Heikin-Ashi Candlestick is hollow (white) when the HA-Close is above the HA-Open. Conversely, a candlestick is filled (black) when the HA-Close is below the HA-Open. This is similar to normal candlesticks, which are filled (black) when the close is below the open and hollow (white) when the close is above the open. While traditional candlestick patterns do not exist with Heikin-Ashi Candlesticks, chartists can derive valuable information from these charts. A long hollow Heikin-Ashi candlestick shows strong buying pressure over a two day period. Absence of a lower shadow also reflects strength. A long filled Heikin-Ashi candlestick shows strong selling pressure over a two day period. Absence of an upper shadow also reflects selling pressure. Small Heikin-Ashi candlesticks or those with long upper and lower shadows show indecision over the last two days. This often occurs when the two normal candlesticks are of opposite color. 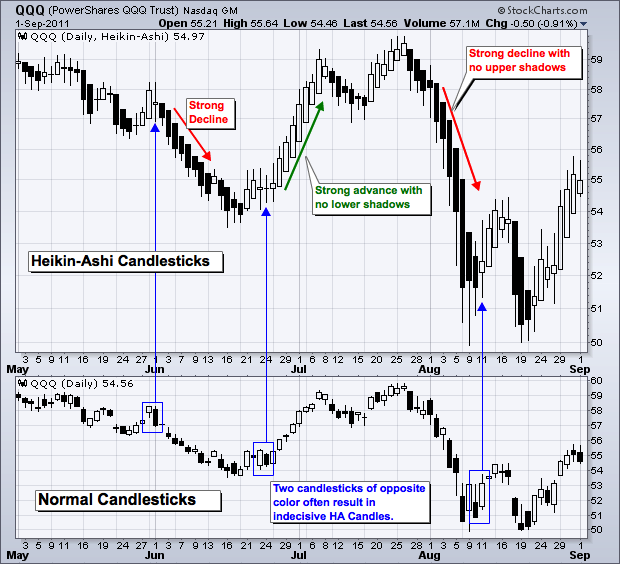 The chart above shows QQQ with Heikin-Ashi Candlesticks over a four month period. The blue arrows show indecisive Heikin-Ashi Candlesticks that formed with two normal candlesticks of opposite color. Indecision can sometimes foreshadow a trend reversal. The red arrows show a strong decline marked by a series of Heikin-Ashi Candlesticks without upper shadows. This means the Heikin-Ashi Open marked the high and the remaining data points were lower. The green arrow shows a strong advance marked by a series of Heikin-Ashi Candlesticks without lower shadows. This means the Heikin-Ashi Open marked the low and the remaining data points were higher. 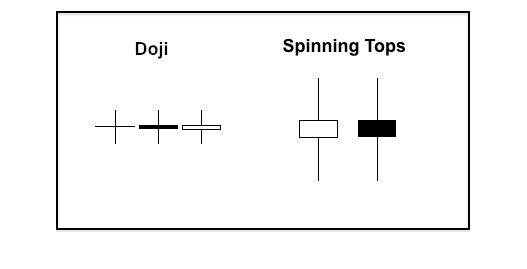 As with normal candlestick, Heikin-Ashi doji and spinning tops can be used to foreshadow reversals. A Heikin-Ashi doji or Heikin-Ashi spinning top looks just the same as a normal doji or spinning top. A doji is a small candlestick with an open and close that are virtually equal. There are small upper and lower shadows to denote little price movement. 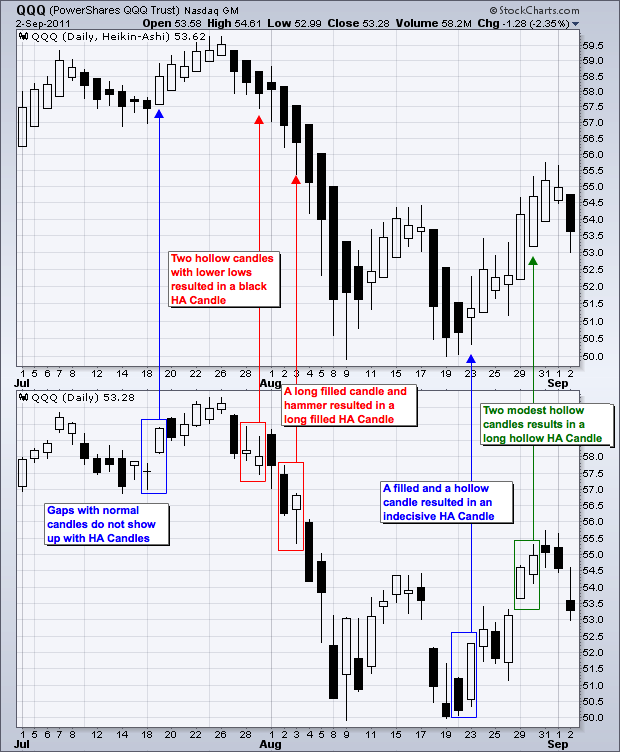 When using Heikin-Ashi Candlesticks, a doji or spinning top in a downtrend is not right away bullish. It just shows indecision within the downtrend. Indecision is the first step to changing direction. Confirmation of a directional change (trend reversal) is required though. Once chartists spot a doji or spinning top in a downtrend, it is time to set a resistance level upon which to base a trend reversal. The example below shows Caterpillar (CAT) with a spinning top forming in late May (1). The trend is clearly down so a resistance level is set to define a reversal breakout (confirmation). CAT did break this resistance level a few days later, but the breakout failed. Not all signals are perfect. 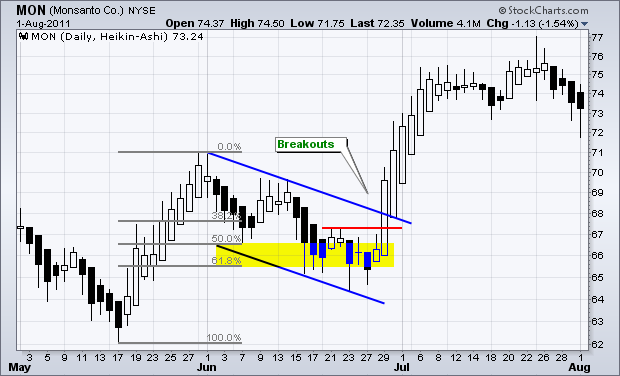 The downtrend extended and CAT then formed two doji in mid June. A resistance level was marked after the doji and CAT broke resistance to confirm a reversal. Prices extended higher until the stock stalled around 110 in July. Two doji and an indecisive candlestick formed in mid July (3). Also notice that a clear support level was established. CAT broke support in late July to start a strong downtrend and confirm the trend reversal. A spinning top formed during this downtrend (4), but there was no upside follow through or reversal. Confirmation of a trend reversal is important. Classic patterns and trend lines can also be used on Heikin-Ashi charts. In contrast to normal candlesticks, Heikin-Ashi Candlesticks are more likely to trend with strings of consecutive filled (black) candlesticks and strings of consecutive hollow (white) candlesticks. The chart below shows Apache (APA) falling with a string of filled candlesticks in late October. The Heikin-Ashi candlesticks formed a falling wedge and APA broke resistance with a surge in early November. 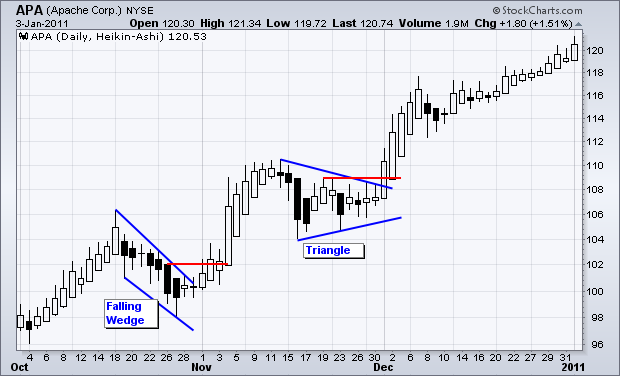 A triangle consolidation then took shape as the stock consolidated in November. The upside breakout signaled a continuation of the bigger uptrend. Heikin-Ashi Candlesticks provide chartists with a versatile tool that can filter noise, foreshadow reversals and identify classic chart patterns. In fact, all aspects of classical technical analysis can be applied to these charts. Chartists can use Heikin-Ashi Candlesticks to identify support and resistance, draw trendlines or measure retracements. Volume indicators and momentum oscillators also work well. Very nice indi and explanation. I'm thinking of combining Allheiken-Ashi_v2.1, Bbands_Stop_V3.0 and AllPivot_V3.7, than will have a new ishakas ashi for our forum. New new ishakas ashi? yes it may be good. 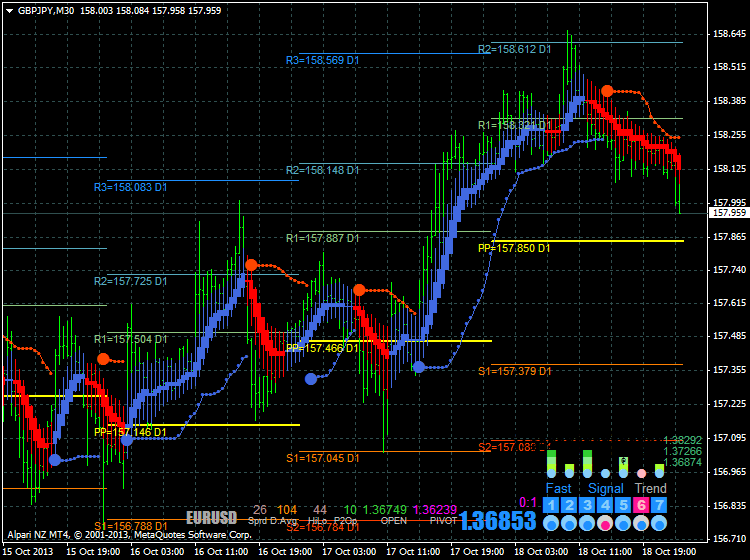 I attached here the template that include 3 indicators and name it AllHeiken-Ashi_trend. I'm suggesting trade on 30min chart. 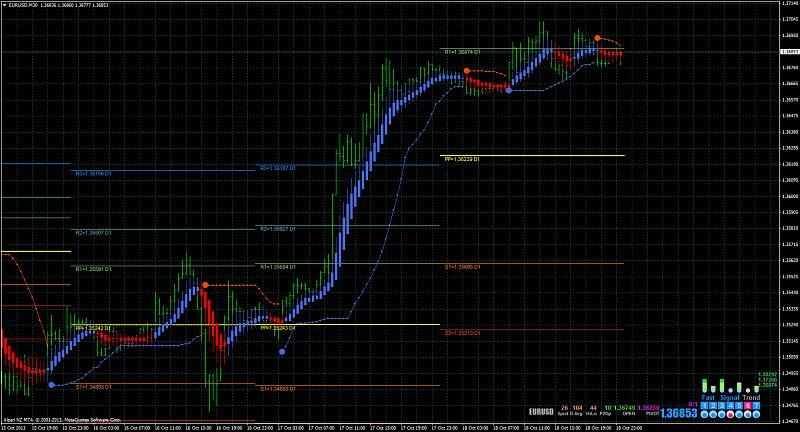 BBand stop as stoploss point, pivot as target profit. Allheiken ashi as trend identifying. I will play this setup around next week, on major pairs. I have forgot to include one more tools, JoGET#58 indicator. 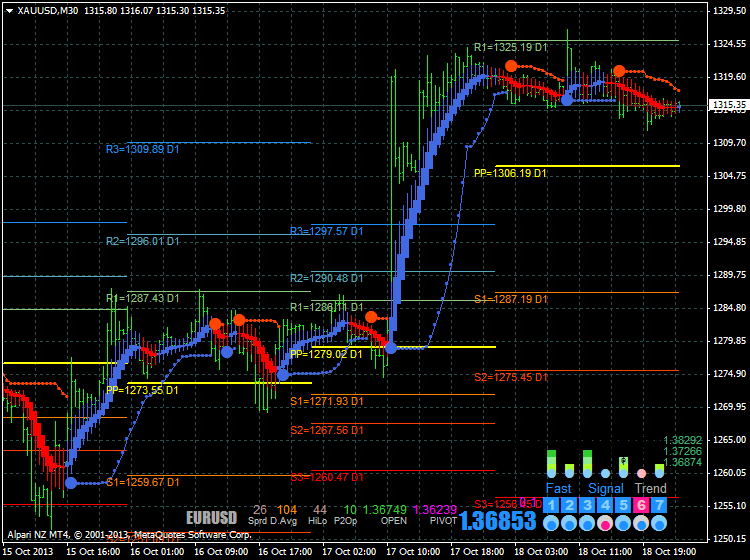 This tools display spread, daily average, Hi to Low in pips,, MA trend in multi tiemframe and so on. It can be use together or without it. doesn't matter. Dormi and Dr.Fox like this.